Due to its large size, Piccolo requires special gel-electrophoresis and Western blotting protocols for visualization by immunoblotting. Excellent results can be obtained, for example, with the 4-12% TRIS-glycine gradient gels of Anamed. For success in WB with Rabbit polyclonal to Piccolo - Synaptic Marker (ab20664), do not denature WB sample lysate. Synthetic peptide conjugated to KLH derived from within residues 600 - 700 of Rat Piccolo. ab20664 gave a positive result in the following tissue lysates: Rat brain and cerebellum. Our Abpromise guarantee covers the use of ab20664 in the following tested applications. IHC (PFA fixed) 1/300 - 1/1000. WB Use a concentration of 0.2 - 0.5 µg/ml. Detects a band of approximately 460 kDa (predicted molecular weight: 520 kDa). May act as a scaffolding protein involved in the organization of synaptic active zones and in synaptic vesicle trafficking. C2 domain 1 is involved in binding calcium and phospholipids. Calcium binds with low affinity but with high specificity and induces a large conformational change. Cell junction > synapse. Concentrated at the presynaptic side of synaptic junctions. IHC image of Piccolo staining in rat brain FFPE section, performed on a BondTM system using the standard protocol F. The section was pre-treated using heat mediated antigen retrieval with sodium citrate buffer (pH6, epitope retrieval solution 1) for 20 mins. The section was then incubated with ab20664, 5µg/ml, for 8 mins at room temperature and detected using an HRP conjugated compact polymer system. DAB was used as the chromogen. The section was then counterstained with haematoxylin and mounted with DPX. Additional bands at: 200 kDa. We are unsure as to the identity of these extra bands. The banding pattern shown in the image above is consistent with the literature which describes multiple bands >420 kDa as a result of proteolysis (PMID : 10707984). This blot was produced using a 3-8% Tris Acetate gel under the TA buffer system. The gel was run at 150V for 60 minutes using lysates heated to 85°C before being transferred onto a Nitrocellulose membrane at 30V for 70 minutes. The membrane was then blocked for an hour using 3% Milk before being incubated with ab20664 overnight at 4°C. Antibody binding was detected using an anti-rabbit antibody conjugated to HRP, and visualised using ECL development solution ab133406. IHC-FoFr image of Piccolo staining on rat brain cortex tissue sections. The tissues were fixed (animals perfused fixed) with 4% PFA and later postfixed overnight in the same fixative. They were cryoprotected in 30% sucrose and cut using a cryostat. The staining was performed using free floating technique. Immuofluorescent staining for Piccolo ab20664 in [A] rat brain hippocampus (X20 objective) and [B] rat brain cortex (X40 objective). Tissue preparation: rat brain tissue was perfusion fixed (4% PFA) followed by post fix and cryoprotection in 20% sucrose before freezing in OCT. 30µm coronal sections were cut on a cryostat for free floating IHC. Primary antibody ab20664 was used at 1/100 (5µg/ml) incubated overnight at room temperature in PBST (triton 0.3%). Secondary antibody used: anti-rabbit Alexa fluor 488 (1/1000) incubated for 2 hours at room temperature. NB: Gels higher than 8% acrylamide were tried without success; 8% or lower is recommended. Denaturing of samples at 70C or 95C was not successful. Reducing conditions were used and 20% ethanol was employed for the nitrocellulose membrane transfer. All steps performed at RT. Publishing research using ab20664? Please let us know so that we can cite the reference in this datasheet. RE psd95 as a loading control. Will psd95 expression we altered if toxicity is increased in the cells? I am not sure how PSD95 expression would be affected if toxicity is increased in your cells would not wantto recommend a product that may be unsuitable. We encourage customers to consult the latest literature available through PubMed and other resources in order to find the most up-to-date information about their specific research interests. Inquiry: We are looking for a loading control for our western blots that is at a minimum 75kDa in size (preferably over 100kDa). Is there anything you could recommend? Our cell type is mouse neurons. 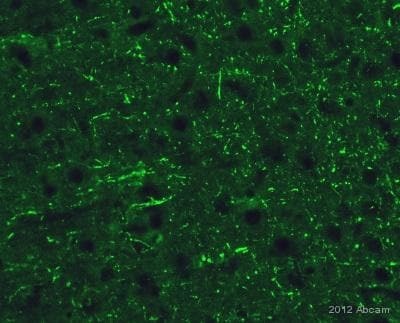 In mouse neurons an alternative to the smaller housekeeping proteins such as beta-actin, or GAPDH commonly used as loading control would be to use synaptic markers such as PSD95 or Piccolo. 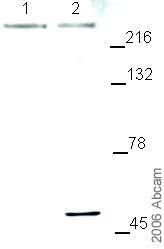 In western blot I would recommend use of anti-PSD95 antibodieshttps://www.abcam.com/PSD95-antibody-Synaptic-Marker-ab18258.htmlorhttps://www.abcam.com/PSD95-antibody-6G6-1C9-ab2723.htmlwhich will give you band above your threshold size at 95kDA. Should you want bands with an even higher molecular weight Piccolo has a predicted size at 540kDA, our producthttps://www.abcam.com/Piccolo-antibody-Synaptic-Marker-ab20664.htmlis, like the above PSD95 antibodies, guaranteed to work on mouse samples in Western blot.